Not many other animals have been as misunderstood and as viciously misrepresented as lemmus lemmus and his relatives. The misconception that lemmings are driven to mass suicide is quite old and very widespread; in reality, lemmings go on mass migrations when the population becomes to big to sustain, and while many of them do die along the way, that’s not due to suicide. But that makes a bad narrative, so when you read a title like Leaping Lemmings on a game box your first guess what those rodents will be doing shortly is going to be accurate. Rick Young and John Poniske have a better than usual justification for the lemming’s autocidal behaviour: the animals in question were bred, genetically engineered and cloned to be as suicidal as possible by a bunch of bored scientists, on a million dollar budget, to settle a $20 bet between them. Their laboratory is located in Waterloo, Montana. Just for a change, I’m not making this bizarre background story up. It’s official. It’s in the manual. On the sound of the bell, every day, the laboratory gates open and hordes of lemmings stream forth, across a stretch of grass and over the edge where, presumably, unfortunate grad students record the leaping distance of the even more unfortunate rodents and award points. Daily migrations of self-harming hamsters don’t go unnoticed by the local predators, and so every day, on the bell, the eagles Stephen Jr. and and Ruby can be seen circling above awaiting easy prey. The race track is a long, narrow stretch of grass with some shrubbery providing cover. The board also shows the hunting area of the two eagles, one after the other, both wide enough to cover the entire board and overlapping slightly in the middle. Control of the eagles passes around the table, giving each player the chance to be unpopular. The eagle player rolls the two dice and moves each eagle by up to three segments of its hunting area, clockwise or counter-clockwise. In the beginning of the game, wherever the eagle arrives will be boring because no lemmings are in the field yet, so lets keep them for a bit later. 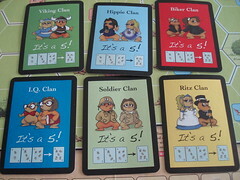 Next, a movement card is revealed showing a number between two and five. This is the number of hexes each player is allowed to move now, starting with the eagle player. 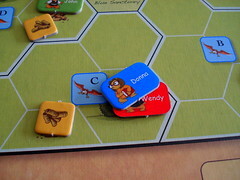 Each player chooses one of his lemmings in the field to move, or sends a fresh candidate into the race from the starting area. Genetically engineered lemmings are driven creatures, so going backwards is never an option and going sideways is frowned upon: you can move your lemming only one hex sideways, all other points have to be spent on forward movement. Moving through or into a shrubbery costs two movement points, but ending your turn in a shrubbery protects you from being eaten. Another good place to end your turn is on top of another lemming, pinning them down until you move on. Any lemming reaching the cliff automatically uses its remaining movement points to hurl himself over, awarding his creator more points the further he leaps. But it’s a long and dangerous way to get there, so lets get back to Ruby and Stephen Jr. now: after their move, they get to eat one lemming in the area they arrive in by choice of the eagle player. However, lemmings protected by shrubs are safe, as are lemmings covered by other lemmings – suddenly being at the top of the lemming pile doesn’t sound so good, does it? The surviving lemmings scatter out of the eagle area, again controlled by the eagle player, so it’s a good time to move opposing lemmings back – allowed when running from the eagles – and give your own a small head start. The area currently occupied by the eagle can’t be entered by a running lemming – that would be a bit like covering yourself in BBQ sauce and go swimming in a swarm of piranhas, it’s just not done. It’s good to keep in mind that the eagles will eat one lemming if one is available without any discrimination. If the only available lemming is from the eagle player’s own team, this creates a strong sense of entertainment for everyone else. There is two more things in Leaping Lemmings to keep the game from getting boring: the first is lemming chow pellets. They are scattered around the board and award the lucky lemming to eat them some victory points or a favour which can be redeemed for various small but very useful effect. The second thing is special cards: every player has one special card available that allows him to move five hexes on his turn, regardless of the current movement card. The other special cards are distributed evenly between the players and have other, more fun effects. 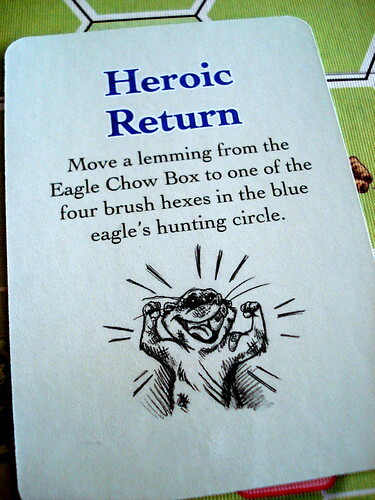 For example, you may reorder a stack of lemmings, move an eagle out of turn or even get back from the dead after being made into a McEagles Happy Lemming Meal (with toy). Or you just keep the cards for the extra points they award at game’s end. And that’s all the rules. Compared to many other games, Leaping Lemmings is very straightforward. There is not many options of what to do on your turn – you move a lemming by a predetermined number of hexes, your only choice is which one and where. I freely admit that I’m usually attracted to games that give me more options what to do, but Leaping Lemmings creates an interesting game out of the limited options it offers. Moving a lemming may be your only choice, but timing and risk management make the two decisions “which” and “where to” anything but trivial. Moving out of the shrubbery just before it’s your turn to be the eagle player is good timing. Doing it only then will leave you far behind everyone else, so you will want to creep away when you’re least likely to be eaten. On top of that, you still need to decide when to pin other lemmings by hopping on top of them, when to pick up lemming chow instead of hiding in the shrubs and, when it’s your turn to do so, where to move the eagle to eat and scatter lemmings and block your opponents way. The few rules and seemingly limited number of options thus turn out to be a very entertaining game – not a deep game by any standards, but neither shallow nor boring. Leaping Lemmings is also quick to learn – a big advantage since you will mostly want to play it with as many players as you can glue to a chair around your table. Technically, you can play with two people with some rule changes or with three people with the standard rules, but Leaping Lemmings is so much more entertaining with five or six players. There is more lemmings on the board, more chances to eat opposing rodents, more competition for the lemming chow and for spots in the bushes. More turns between each players eagle turns add some tension to the game and more people that can potentially use their special actions add more chaos to the whole process. There is no significant downside to playing with more players since everyone can take their turn in just a few seconds keeping the game going forward. So if you have the chance, play with five at least. Another thing Leaping Lemmings has going for it is the quality of the production: the game board is more utilitarian than decorative, but the lemmings counters – sadly, there is no lemmeeple, but they wouldn’t stack very well – and special cards have an adorable cartoon style that goes well with the wacky theme and the whole game is made from durable, heavy material that many other publisher’s could take as an example. Publisher GMT Games is better known for their wide selection of war games, but this excursion into more euro style games is undeniably successful and while wargames don’t hold much interest for me, I’ll definitely keep an eye on their selection of euro and family games from now on. If you’re reading us from Germany and want to try Leaping Lemmings: it’s available here from Udo Grebe Gamedesign who kindly provided us with our review copy.